The Cheraw Braves are 9-3 on the season. The finished tied for 3rd place with Chesterfield in Region 4-AA. Because of their finish, they picked up a #3 seed in the playoffs. Cheraw beat Gray Collegiate 28-18 in the first round and they whipped Blacksburg 40-6 last week. The three losses on their record came by way of a AAAA Marlboro County team, who finished with a 3-8 record. They also lost two region games. The first to Lee Central, who won their region, by a 14-7 score and they also lost to Chesterfield 38-21. In his 2nd year at the helm of the Braves, head coach Andy Poole has a 19-6 overall record. Now that you are a little more familiar with Cheraw’s season, let’s look at the players that will be on the field Friday night. Bradley Holliman is the senior quarterback and catalyst of the team. His numbers don’t wow you, but he’s a good game manager that doesn’t turn the ball over. He’s thrown for 1,493 yards with 18 touchdowns and 8 interceptions on the season. He’s completed 54% of his passes. Most of those have went to #7, sophomore wide receiver Jalen Coit. He has 46 catches for 858 yards and 9 touchdowns on the season. The Braves offense is very balanced and very multiple. You may see them with 4 wide outs one play, and in the wishbone the next play. The bell cow for the Braves is 5’11 170lb junior running back Quan Pittman. He has 256 carries for 1,542 yards and 17 rushing touchdowns on the season. He has 10 – 100 yard rushing games so far this season. Cheraw likes to feed Pittman the ball, draw your defense in tight, and then hit Coit on a play action pass. That’s their bread and butter offensively. The real calling card for the Cheraw Braves however is their defense. Allowing 16.6 points per game, they are a tackle for loss machine. The Braves have a big, physical defensive line that usually eats up the offensive blocking and allows their linebackers to roam freely. 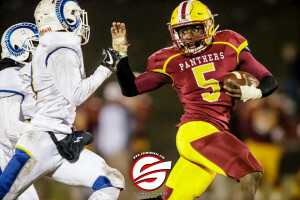 #5 Nick Dozier has 48 tackles and 21 tackles for loss this season. Starting linebacker #44 Tallon Campbell has an amazing 145 tackles on the season so far with 11 tackles for loss. The Panthers have faced nearly every possible type of offense this season, so Cheraw won’t do anything they haven’t seen before. The biggest question for the Panthers is if they will have enough players to fill the roster. Nate Temple broke his arm in last weeks game. The junior starting defensive end has 79 tackles, 9TFL and 2.5 sacks on the season. His status is doubtful this week. The Panthers offensive line is banged up, Dooley Sanders is a game time decision and so is starting quarterback Bryce Jackson who is dealing with a leg injury. JD Moore will get the start at quarterback should Jackson not be able to play. Moore is a very capable athlete when given the opportunity. Coach Nickles stated that this is the most injury plagued season that he can recall since his first season as an assistant in 1993. The game of football isn’t for the faint of heart, that’s for sure. The Panthers will have to match the physicality of this Cheraw team, and just do what they do best. Run the ball, control the clock and try to get out of this game without any new injuries. It should be a great game, and a great atmosphere with an Upperstate Championship game appearance on the line.